Okay, Daily Billboard is officially excited. 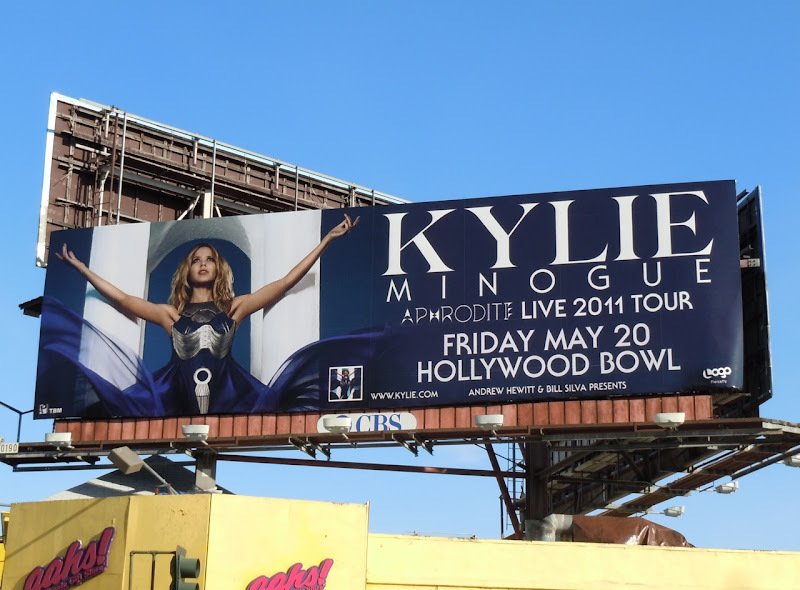 Kylie Minogue is coming back to perform again at the Hollywood Bowl on May 20, 2011. This confident image for the Impossible Princess virtually sings its siren song calling all the gay men to her Aphrodite Live Tour. The wonderful Aphrodite is her fifth studio album to reach number one in the U.K. and she is the only female recording artist to achieve a number one album in four consecutive decades, the 80s, 90s, 00s and 10s. 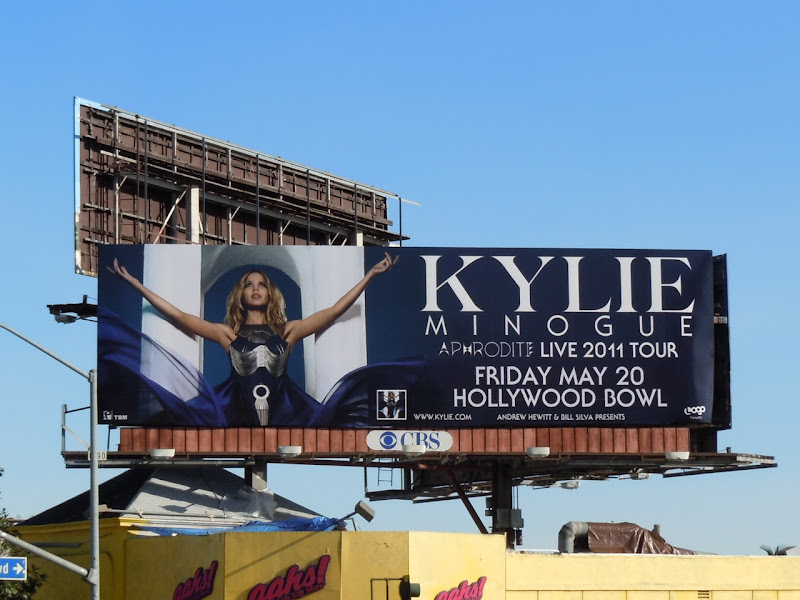 This music concert billboard was snapped at San Vicente and Sunset Boulevard on February 6, 2011. If you're a fan of the pop princess from Down Under, be sure to check out photos from Kylie's first ever Hollywood Bowl concert on October 4, 2009 and a rooftop tribute for All The Lovers for West Hollywood's Gay Pride in June 2010. 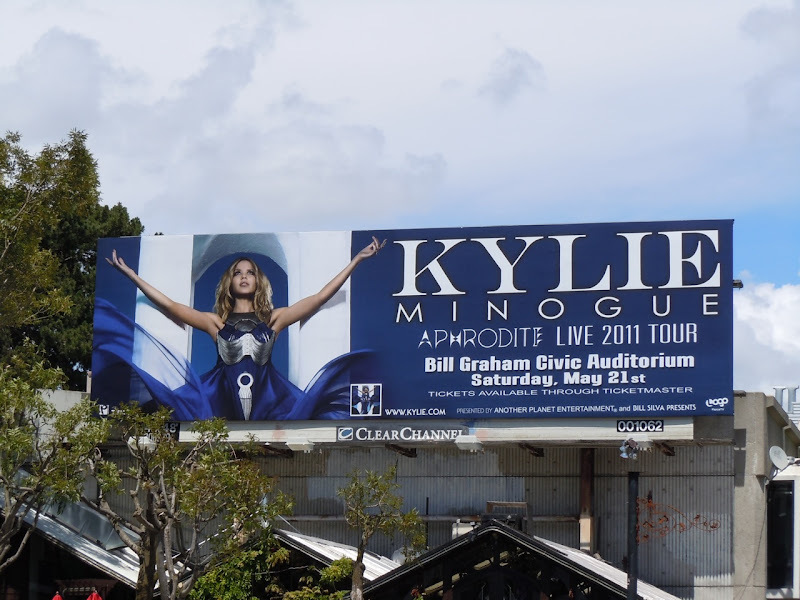 UPDATED: Check out Kylie's San Francisco Aphrodite Tour billboard snapped at Market & Noe above Cafe Flore on May 17, 2011. Ms. Minogue will perform in the City by the Bay the night after her Hollywood Bowl concert. Plus check out these cool photos from Kylie's Aphrodite concert at the Hollywood Bowl.